Out of the top 100 iPad apps in Apple’s US App Store (top 50 free and top 50 paid), 30 apps were absent from Google Play, and 18 were available but not optimized for tablet users. That leaves us with 52 apps that had Android versions both available through Google Play and optimized for tablet use (meaning they weren’t just a smartphone app blown up to the size of a tablet screen). 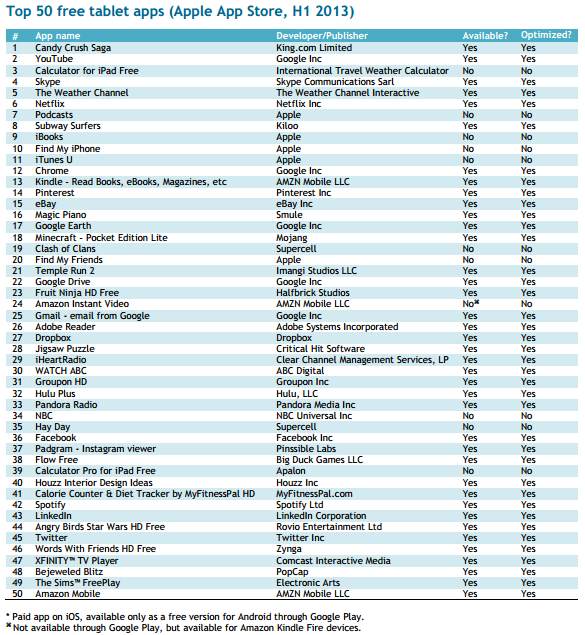 Update: As has been pointed out by readers, the list is skewed by the fact that Apple only makes apps for iOS, while Google makes apps for both platforms. As such, the situation is not as bad as it may seem at first glance. 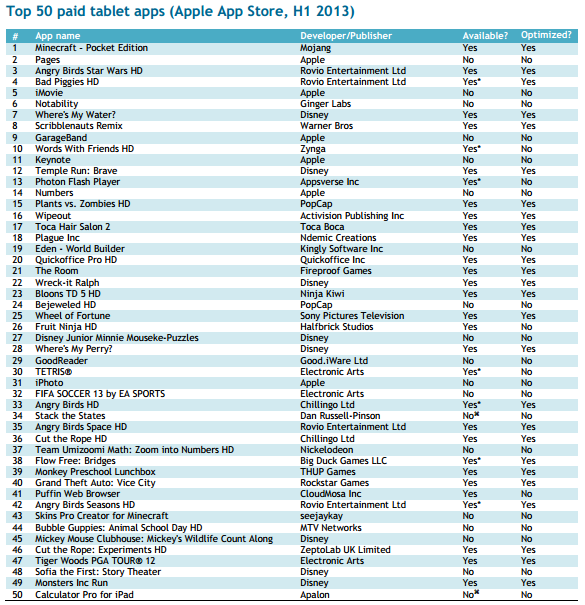 The latest findings come from Canalys, an independent analyst firm which used aggregated daily rankings in the first half of 2013 to find the list of iPad apps to check against. While it is estimated the last quarter saw more Android tablets ship than iPads, the app ecosystem on Google’s platform has yet to catch up to Apple’s. Canalys says it expects this trend to change as the number of Android tablets continues to soar and Google brings improvements to the Play store. Yet the firm warns that if Google doesn’t do more than just encourage greater numbers of developers to invest in delivering high-quality Android tablet apps, it risks disappointing consumers in the short term. In other words, Apple had a notable head start, and it’s going to be a long time before we’re checking the top 100 free and paid Android tablet apps to see what is offered on iPads.